Each studio class begins with an individual drawing experience. The children are encouraged to draw whatever they wish using a variety of media. This collection, from the smallest squiggle to an intricate design, evolves weekly into an artistic journal of your child’s personal development. This class is designed to provide young children with an inviting creative setting where they will be free to engage in the process of discovering color, paint, markers, oil pastels, clay, movement, and the joy of welcoming creativity. The curriculum is developmentally-based, and is introduced to the children in a playful and energetic way. 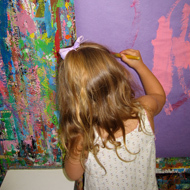 We will move through different creative experiences in both two and three dimensional art forms that pay careful attention to young children’s imaginations and perceptual development in an open and receptive environment. This class is devoted to teaching youngsters the process of making art while giving them the ability and inspiration to develop their visual perception in a natural and unhindered manner. Through the support of parents, the child will gain confidence in his/her awakening sense of creativity and visual development. Color! Learn how it moves. Learn how it mixes. Learn how it dances. Learn how it smiles. 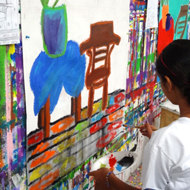 See colors, lines and shapes come to life as young artists paint and draw their dreams on large pieces of paper. 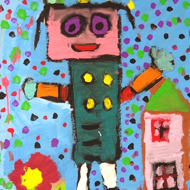 Children will be inspired to paint and draw with energy, invention, and freedom of expression. Furthermore, students will be given the opportunity to paint on canvas with acrylic paint and to explore more formal painting techniques and practices. We will paint still lives, self-portraits and from the model to learn about observing life and how to interpret what we see in paint. Have you ever wanted to become a royal princess, a ferocious tiger, a wacky robot or a zany lizard? If you have always dreamed of creating your own masks to wear, scare, charm or amuse your family and friends…then, this exploration is for you! Through studying World Cultures’ mask-making traditions and creations, the students will discover their unique place in this global practice of transformation. The class will introduce the mask-makers to many special materials and mask-making techniques that will inspire and result in diverse mask creations. Pinch it! Roll it! Mold it! This class introduces children to the basic building blocks of clay construction (slab, coil and pinching techniques) and also teaches them how to use various clay tools to enhance and transform their clay. We will explore the world of clay animals, vases, castles, masks, puppets and many other imaginative creations. We will also focus on glazing, painting and firing each completed project, so that a fantastic world of ceramic creatures, vessels and forms will be preserved for always. Styrofoam balls are starting to speak! Sticks are dancing and singing! Cereal boxes have grown eyes, noses and mouths! A sock has a tongue! ”Where am I?” you ask shocked and in disbelief. The old frog marionette rises and croaks, “in the wonderful world of learning to create puppets and make them come to like with joy and energy.” The puppet class teaches the young puppeteer many different puppet making techniques (finger, stick, box, marionette, sock and many more). In addition, the students will be introduced to diverse materials that will bring details to their puppets with color, costumes, unique expressions and shiny glowing hair! We will explore many different types of sculpture using wood, clay, plaster, wire, paper mache, styrofoam and many other materials to excite our hands and discover the tactile world of three dimensions. The children will be introduced to the inspiring, sculptural achievements of Twentieth Century Artists; and we will also explore the sculptural traditions of other cultures from around the globe. We will utilize found-objects from the environment to create assemblages. The students will have the opportunity to experience sculpture in a direct, focused and encouraging atmosphere that believes in the power of a young sculptor’s hands. The unique and reproducible world of printmaking is taught in this class and is sure to leave a “lasting impression” on your child. We will explore the inventive process of printmaking with stamp prints, relief prints, plaster prints, monoprints and many more exciting printmaking techniques. This class will enable young printmakers to take home many colorful impressions of favorite prints, so there will always be enough artwork to share with family and friends who are interested in the multiple world or printmaking. In our older classes the curriculum continues to expand and challenge each student while remaining committed to our goals and philosophies of art education. The curriculum still has experiences rooted in our core projects/experiences of the mixed media class, but new concepts are woven into the teaching and learning. Observation from life in both drawing and painting will be fostered, while not forgoing direct improvisatory painting practices from the imagination. Sculpture projects are more complex and involved with contemporary art practices. The Studio believes this curriculum will allow maturing children a creative and stimulating environment that nurtures their imagination and sense of self.